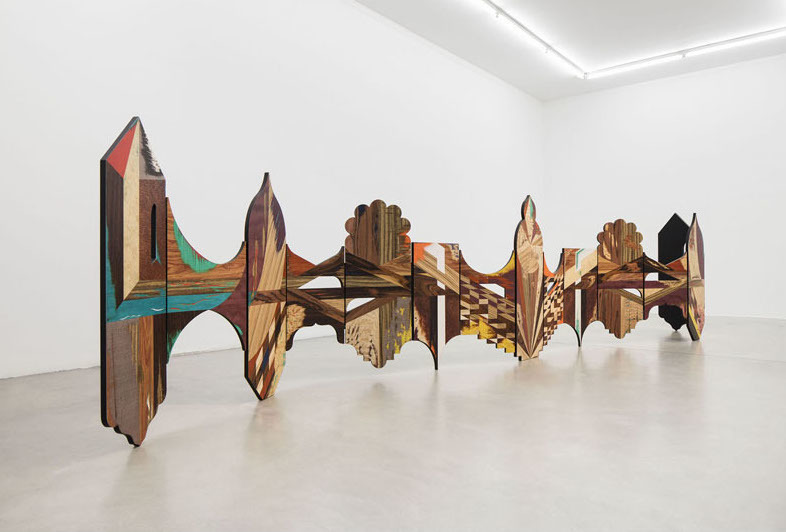 Riccardo Beretta, Paravento (First Victims Playground), 2017, inlaid wood and terrasanta relief on natural veneers and natural dyed veneers, dimensions variable. Throughout the show, there are also works from the series “Recovered Playground,” 2016–17, which consist of images of playgrounds, printed from the internet, then covered under layers of paint—perhaps signifying territories with fluid boundaries, where memories and feelings accumulate over time. The gallery’s final room features “Sleeping Bag (Negative Cognition),” 2016–17, a series of fabric pieces that resemble the titular sacks. Beretta has embroidered them with phrases (in a font he designed) based on psychotherapist Cristina Mastronardi’s research on trauma and resilience. The entire show considers the unstable boundaries between movement and stasis, wakefulness and sleep, consciousness and all that lies beneath it.